Shortcut for a LangAltValue auto pointer. Type used to store language alternative arrays. Shortcut for a XmpValue auto pointer. Constructor, reads the value from a string. Return the text value associated with the default language qualifier x-default. The parameter n is not used, but it is suggested that only 0 is passed in. Returns an empty string and sets the ok-flag to false if there is no default value. Return the text value associated with the language qualifier qualifier. Returns an empty string and sets the ok-flag to false if there is no entry for the language qualifier. Return XMP array type, indicates if an XMP value is an array. 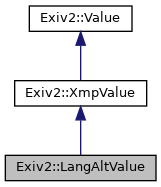 Return XMP struct, indicates if an XMP value is a structure. Set the XMP array type to indicate that an XMP value is an array. Set the XMP struct type to indicate that an XMP value is a structure. Map to store the language alternative values. The language qualifier is used as the key for the map entries. Return XMP array type for an array Value TypeId, xaNone if typeId is not an XMP array value type. Value type for XMP language alternative properties. A language alternative is an array consisting of simple text values, each of which has a language qualifier. Read a simple property value from buf and append it to the value. Appends buf to the value after the last existing array element. Subsequent calls will therefore populate multiple array elements in the order they are read. The XMP default language code x-default is used if buf doesn't start with the keyword lang. Write all elements of the value to os, separated by commas. The output of this method cannot directly be used as the parameter for read().